2014 was hailed the year of video for marketing and social media and in 2015 it was predicted to continue to grow even more. 2015 is most definitely the year of the streamed video and Periscope is leading the way right now. Periscope gives people the opportunity to live stream their exact place and thoughts in real time. 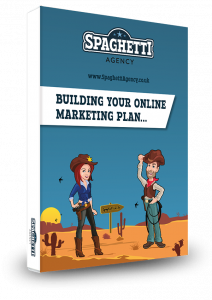 It’s real and interactive – and it’s one of the most powerful tools I’ve seen for a while! 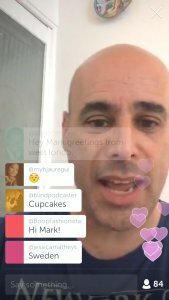 What periscope offers is not only live video streaming but also live comments from the viewer, right there, right away. Gone are the days when YouTube comments were left unanswered. Gone are the days when they were just spammy, pointless comments written by keyboard heroes and trolls. I think the comments on the live stream on Periscope give real interaction with people from all over the world, and as a scoper, you can really connect… I mean REALLY connect! I’ve spoken to keynote speakers from all over the world. Periscope has given me, and the people I’ve spoken with, the opportunity to interact in a way that we’ve never been able to before. Sure, you can tweet people, you can friend them on Facebook, you could send an email or comment on a YouTube video, but you could never really speak to them live. It’s just people sharing pointless things and nattering. But do you know what? Sharing our journey, talking and communicating is a human need. We need to communicate, and most big things start from small conversations. Periscope is giving us this chance in a fast and live way. 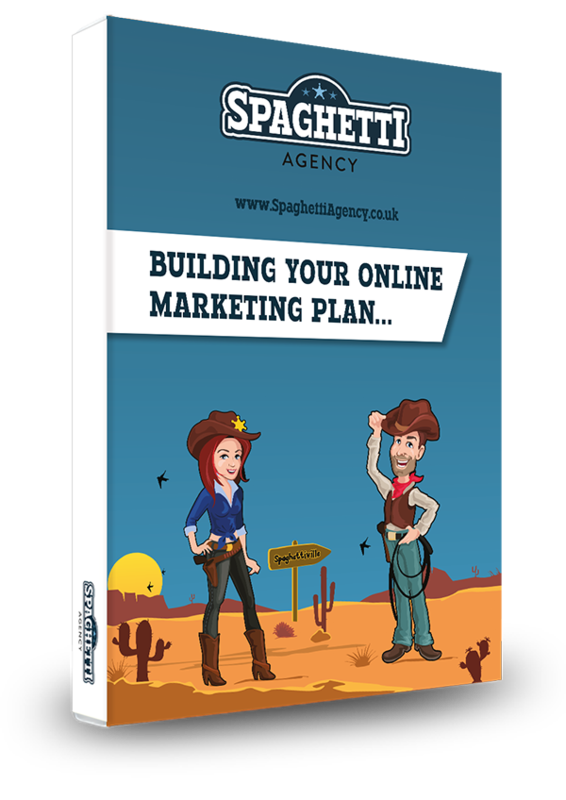 Telling your story is, and always has been, one of the best ways to market your business. Periscope is live and allows people to interact with that story in a really powerful way. Periscope lets us to engage with our audience in the best way possible. Storytelling has and always will be an amazing way to market yourself and your brand or your business and Periscope is one of the best ways to do it in 2015. So how does Periscope work? 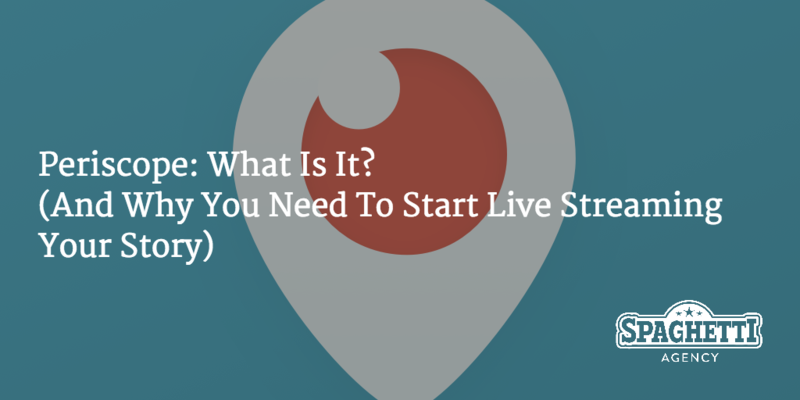 Periscope live streams you and what you’re seeing whenever you want to. It’s often just you and anyone who watches the stream. When you start a Periscope broadcast anyone that follows you on Periscope will get a notification on their app to say you’re live, and Periscope will drop a link on Twitter to tell your Twitter audience too. Yes… there are a lot of pointless scopes out there. Don’t rambling on about nothing. Have a focus for your scope and try to offer value if you’re using Periscope for your marketing. Just like blogging or YouTube videos, if you offer value then people will involve themselves in your content. Create a great headline for it. Trust me… it’s all about the headline. You know newspapers, blogs, films, anything that has a title… it’s all about the title. Create compelling titles for your scopes and people are more likely to click on them. Periscope is live, and that means when you hit ‘broadcast’ only you know that you’re about to go live (unless you’ve picked a time and told your tribe of followers when that is) so wait for people to join. I’ve seen too many scopes half way through and missed the point. Say hi to people as they join, ask them how they are, converse with them and warm up the slot. Once you have a good audience ready, start your talk or topic. You may feel like you’re rambling but it’s kinda like people turning up to your talk early. Pressing broadcast merely allows people to join: it’s not your gun to start talking about your topic. The comments are by far the most powerful part of Periscope. Make sure you answer questions if they’re not too busy and flowing too fast. Interact with people and encourage them to comment. If you’re broadcasting then you simply answer back with your own voice. If you’re watching and want to comment then type your comment in the comment box at the bottom where it says ‘say something’. You can reply to people’s comments as a viewer too. If you tap on a comment by someone else you can then reply just like you can on Twitter. The reply will be bold on the person’s screen that you’re replying to. Comments scroll up the screen and disappear very quickly so you have to be quick to interact, follow and reply. You can hide the chat if you want to by swiping left on iPhone or up on Android. But only do this if you really don’t want Periscope to work for you. Comments are so important to the flow and interactivity. Periscope is live and you can see how many are watching in the bottom right corner of the screen if you’re broadcasting or viewing. If you want to find out all the names of the scopers then swipe left on iPhone or swipe up on Android and you’ll find the map view of where the scoper is and below it are all the live viewers. You can do this when you’re watching or scoping and as a broadcaster you can use this to say hi to your audience or pull people into the conversation by simply calling them out and asking them to comment. It’s a good thing to do and as you get better you can use this tool to really ramp up the conversation. 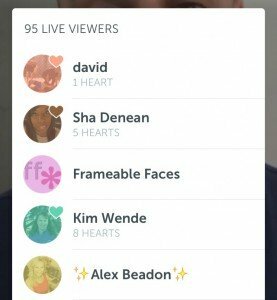 Periscope has hearts. Hearts are little notifications that show the broadcaster you like what you’re seeing and hearing. To give a heart, simply tap the screen (once for one heart). Some people are getting 1000s of hearts per broadcast and these metrics help to show who’s doing great things… and who’s not! Hearts are different colours and they relate to the colour you’re given when you join a broadcast. You won’t always be the same colour and sometimes you’ll be brown… brown hearts… eww! Sharing the broadcast is automatic as a broadcaster. A link goes straight out onto Twitter as soon as you hit broadcast. 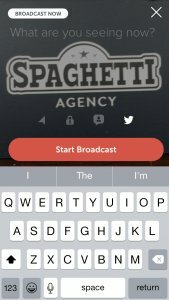 Viewers can share the broadcast by swiping left on iPhone or swiping up on Android and hitting ‘share’. You can share it with your Periscope followers or you can share it on Twitter or you can do both. You should also promote the scope early in the day and tell your fans and followers when you’re going live. Because Periscope is live the timing and planning is important. You can scope from the front or back camera on your smartphone but it always starts with the back camera. A little tip I learnt here is to point your camera at a logo or image that depicts your talk or brand. You can’t start with your front camera (the one you need to use to see the screen, comments and interact). This may change, but until then, just point your camera at something compelling as this is the preview it will show on Periscope to people looking around. This is also the image is shows to people on the web link that they can watch up to 24 hours later. To switch cameras, just pull the screen down and the icon is in the top right corner. Please don’t switch back and forwards on your camera throughout the broadcast though. Yes you can switch a few times but the broadcast goes black and sometimes it goes silent too. Don’t talk for a second while you switch cameras, and try to limit how many times you do it. For quality it’s best not to shake the camera or hold it in your hand. The best scopes I’ve seen are in a holder or seflie stick as they give the best quality video and sound. Your microphone on your iPhone for example is on the bottom so resting it on your bed just muffles the sound. Don’t leave it too late to join Periscope. I think now is the perfect time to join. Yes, it’s raw and no one really knows what they’re doing. No, people don’t realise the hearts are the same colour as their profile and they don’t know how to share it on Twitter properly. It’s only recently that Periscope has become live on the web as well and you can also watch them later online too. But I like this ‘build it as they use it’ attitude. I love that we’re shaping the platform and I like it that improvements are coming all the time. UPDATE 13/8/15: Periscope have just announced that they now have 10M registered users sharing 40 years of video per day! The exciting journey just hit a big milestone. Read the full story here on their blog. Get involved now. Even Periscope are sharing their story… no, not on videos, but by allowing us to be part of the journey as it evolves. We’re the people who are telling Periscope what it is. Periscope was released before it was ready. Periscope was released rough and ready. We’re learning to use Periscope and Periscope are learning how to create Periscope. But I think that’s a powerful way to market any product. Sit down in front your screen and watch what other people say and how they interact and see how they’re using it. I’ve seen some amazing people using Periscope I’ve seen top, world-leading marketers using it and mess it up! That’s what I think is brilliant about Periscope – seeing the human side of these amazing people who we hold in such high esteem. Being human is a good thing! Periscope is the future of social media and I firmly believe that gone are the days when we type things. I even dictated this into my iPhone. Siri typed this blog! Cheers Siri. Typing is so old hat, reading is quite old hat too. If you go to a website now and there’s a video instead of text you’ll probably watch the video. Your customers and fans want to see the people behind the brand or business. Periscope gives you the opportunity to give them what they want. Get your Periscope account now. Download the app, which will automatically sync with your Twitter, and get your scoping game on! Need more help? Follow me @SocialMediaTodd on Periscope. Thanks for your honesty. I admire it. Not sure I agree, as the biggest marketers in the world are all over it, but power to you, my friend!